The death of a loved one, whether it is expected or not, can throw you and your family into turmoil as you enter a period of grieving. There are so many things that must be handled, it is easy to become overwhelmed. Some things must be dealt with quickly, while others can wait a few days or weeks. In some cases, these items may be handled by a friend or family member, while in others they must be completed by the Executor of the estate or another individual specified by the decedent or by law. Here is a list of the top 10 things that typically must be handled. Note this list is not comprehensive and other tasks may still need to be completed. If your loved one dies in the hospital or a nursing home, hospital staff will issue a legal pronouncement of death, discuss their process, tell you what they need from you, and advise what help they will provide. If the death occurs at home while under Hospice care, contact them, otherwise, call 9-1-1 to report the death. You may wish to get multiple certified copies of the death certificate (a dozen or more are often required). The funeral home typically assists with obtaining these. If your loved one is an organ donor or has left his or her body to science, time is of the essence. Medical professionals should be made aware if a terminal patient desires to be an organ donor. If death is anticipated in the hospital, doctors there will likely speak to the family about their loved one’s wishes. If the deceased did not indicate a preference, family members may be asked to make that decision. Reach out and contact immediate family to let them know of the death. They will also be grieving but you might want to take them up on offers to help while working through final details. Make certain any dependents (minor children, adult children with disabilities, or aging parents) are told of the death and cared for during this transition period. Locate the original signed will and legal paperwork for instructions on guardians for the dependents. Don’t forget to arrange care for any pets owned by the deceased. 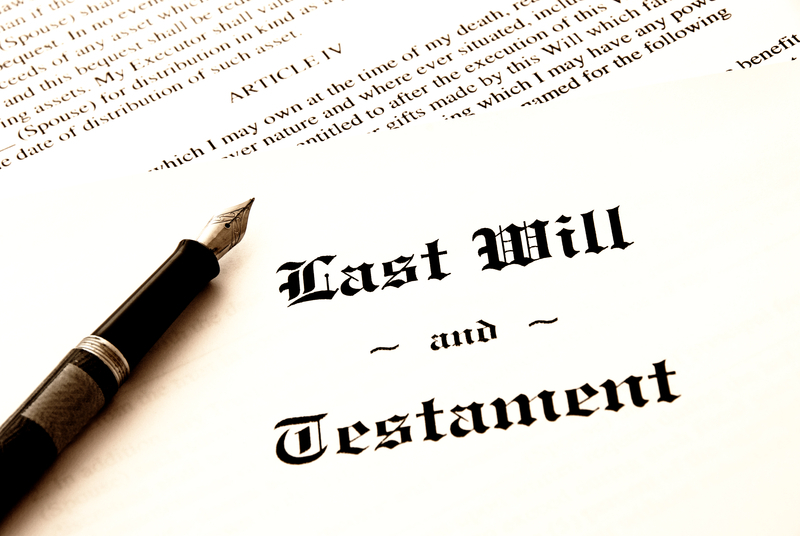 In a best case scenario, your loved one will have discussed or even written down his or her wishes with the family and made certain you and/or the Executor were made aware of where to find the estate planning documents. Review the documents for any final wishes or the existence of pre-paid funeral arrangements. While you are looking, set aside any life insurance policies, birth certificate, marriage certificate, bank information, deeds and titles, tax information, bills, and the deceased’s Social Security card. If he or she is a Veteran, additional benefits may be owed through the Veterans Administration. It will be important to know who the Executor of the estate is (if one has been named) and whether probate will be required based on the estate value and structure. If the deceased left instructions for funeral preparations (i.e.,Did he or she wish to be buried or cremated? Have a big funeral or something simple?) or had a pre-paid funeral plan, use those as a guideline. If not, you may wish to ask others for recommendations on a reputable funeral home. Funerals can be expensive, so get costs associated with the options before deciding how best to proceed. (You may wish to assign this information gathering to another relative or close friend. They may also help collecting information for the obituary.) A health care power of attorney is ultimately in charge of the disposition of the deceased’s remains or, in the absence of a health care directive, the executor has that authority, or if there is no will, then the immediate family. Contact extended family, friends, and any employers. Reach out to others in the family and circle of friends to let them know of your loved one’s death. If he or she was working, the employer will need to be notified of the death. The widow(er) or Executor should be able to find out if there was a company life insurance policy, pension, or other benefits payable upon the employee’s death. The spouse or Executor should notify financial institutions and insurance companies of the death. The Social Security Administration must also be notified. If the deceased was receiving Social Security, any monies paid in the month of death must be returned, and are typically withdrawn directly from the deceased’s bank account by the Social Security Administration. The Executor of the estate should open probate, if the deceased owned assets in their individual name or anticipates property or income to be payable to the estate. If your loved one had a local estate planning attorney, the Executor should contact him or her directly for instruction and assistance as they should be familiar with the deceased’s documents and wishes relating to their estate. The Executor should put in a forwarding order with the Post Office and look for email and login information for online accounts so the estate can track expenses, notify creditors, discontinue service, sell property, or pay outstanding bills. If ownership of a business is involved, the Executor may wish to speak with an attorney for more detailed information on how to proceed. There may be specific rules or corporate documents in place governing the sale of the ownership share upon the death of a partner or shareholder of a small, closely held business. This list of things to do may seem overwhelming, especially at a time when you are grieving and stressed. Many of these tasks may fall to the Executor of the estate. Trusted relatives or friends may be able to help with others. Also note this list is not all encompassing; additional tasks may come up over the months following the death. Remember to take care of yourself and ask for help if needed. If your loved one died unexpectedly as the result of another person’s actions or potential negligence, their death can be even more stressful on the surviving loved ones. In addition to dealing with all the usual details, you may be dealing with calls from insurance companies or the media. We recommend you speak with a personal injury attorney immediately to help deal with those issues and the steps necessary to protect the rights of the deceased’s dependents through a wrongful death action if warranted. This article is not a substitute for legal advice. The reader should contact an attorney to address legal questions or obtain legal advice. Is the “look back” period regarding medicaid applications still 5 years?